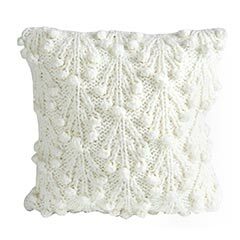 Wind and Willow Home: Sweater Pillow - buy it or make it! Sweater Pillow - buy it or make it! This pillow caught my eye while skimming home decor, end of season deals today. Of course I like to keep up with end of season items since I can't pass up a good deal. This Pom Pom Sweater Pillow is worthy of a post because it is so versatile. White makes it clean and universal in style. The sweater pattern lends warmth and depth to any room. Find it at Pier One. It's also a great upcycling idea for using your old sweaters. Follow the directions from Sweet Something Design for a step by step tutorial. Did you try it? If you have any tips for this project share them in the comments section below. Share what you made! Send your pictures to me: email me at I want it! Projects and I will feature your project.